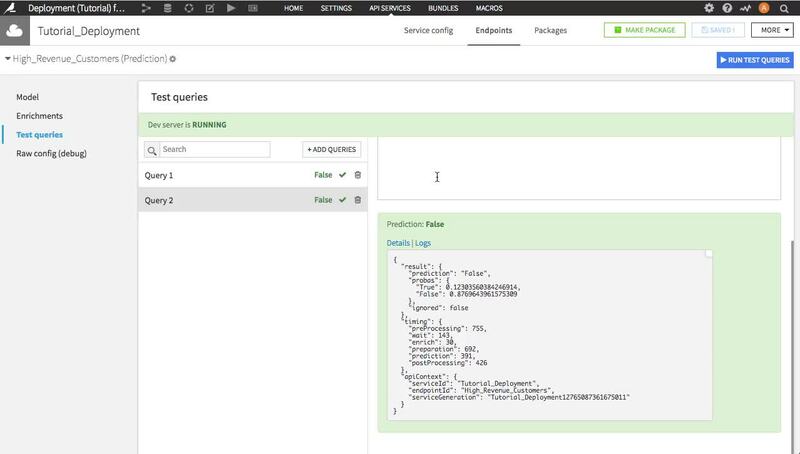 Dataiku DSS allows you to deploy predictive models for real-time scoring using its Dataiku API node. We will work with the fictional retailer Haiku T-Shirt’s data. 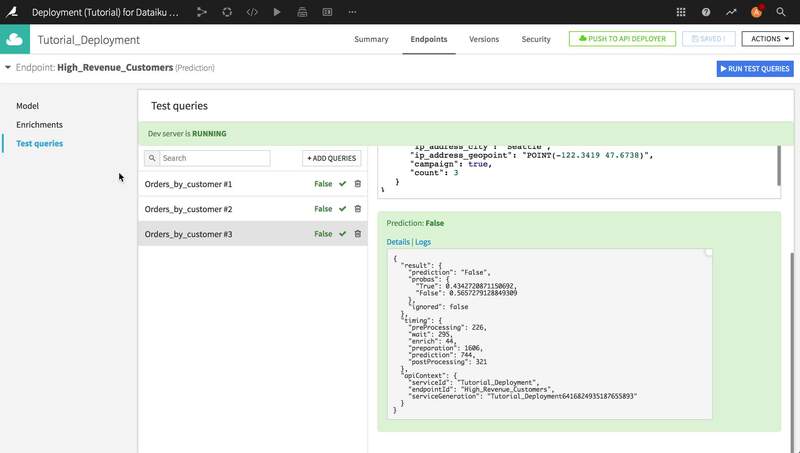 In particular, we assume that the Design node is connected to the API Deployer node, and the API Deployer node has a static infrastructure defined over the API node. If you have already completed the Tutorial: Deployment to production, we are going to use the same project on the Dataiku Design node. From the homepage of the Dataiku Design node, click +New Project, select DSS Tutorials from the list, select the Automation grouping, then Deployment (Tutorial). For the purposes of this tutorial, the model is complete, and we simply need to package the model and deploy it to the API Scoring node. API services are defined in one or more Design or Automation nodes and pushed to the Dataiku API Deployer, which in turn deploys the services to (possibly many) Dataiku API nodes, which are individual servers that do the actual job of answering HTTP requests. In this section, we are going to define a scoring service on a Design node. In the next section, we will use the API Deployer node to deploy and activate it on an API Node. A Dataiku API Service consists of one or more endpoints, e.g. URIs to which HTTP requests are posted, and from which a response is thus expected. For example, getting a prediction score is accessible from an endpoint in a specific service. Dataiku provides easy creation of such endpoints on Dataiku models (i.e. built in a Dataiku analysis), or on models generated with custom code. A Dataiku Model is more than just a mere machine learning algorithm. It includes the entire pipeline starting from raw data, through cleansing of the visual preparation and feature preprocessing, and finally to the model scoring. 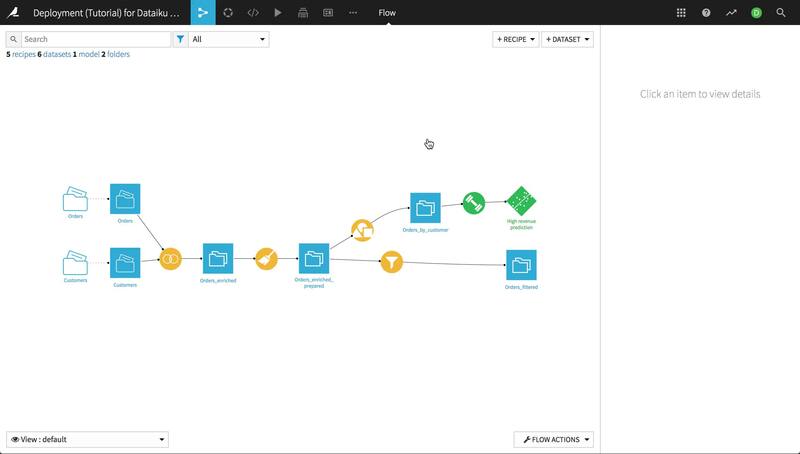 In order to be used in an API endpoint, the visual models have to be deployed to the Flow. A video below goes through the content of this section. Let’s start the actual work on the definition of the prediction service. From the project Flow on the Design Node, select the High revenue prediction model and click Create API. In the “New scoring API from model” dialog, name the API service Tutorial_Deployment, and name the endpoint High_Revenue_Customers. Click Append. 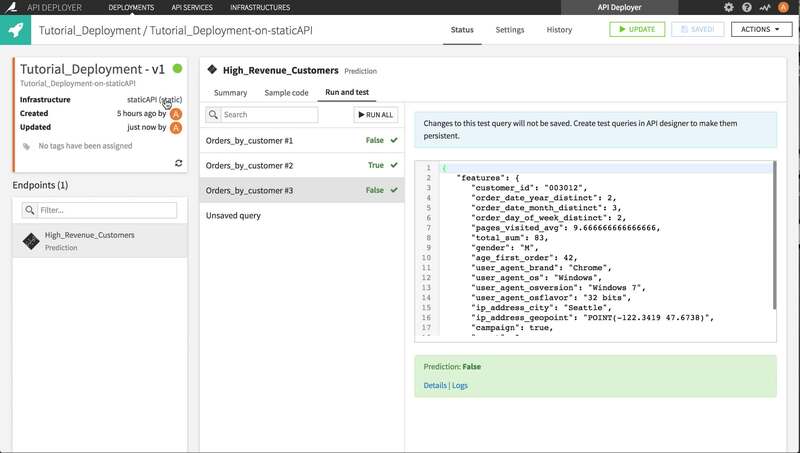 The model for predicting whether a customer will become high-revenue is now part of the Tutorial_Deployment service and ready to be used. Before we package the service, let’s explore the endpoint a bit. Enrichments is used for feature enrichment using a lookup on an additional table. This is useful when the model includes features that might not be available to the client making an API request. For example, say our model incorporated information about demographic and economic indicators for the country a customer comes from. We would then want to do some real-time enrichment of the query. Test queries are useful to check that everything is working as expected and to understand how to query the endpoint. On the Test queries panel, click +Add Queries, then add 3 queries from the Orders_by_Customer dataset, and click Run test queries. You can see the results of the tests and whether they are correct according to your model. Clicking on the Details, you can see the results of the tests and whether they are correct according to your model. The Logs tab (next to Details) provides logging and can be used for debugging/troubleshooting purposes in case something fails. Your service is now ready. Click Push to API Deployer. Login to your Dataiku API Deployer node. Tutorial_Deployment can now be found in the list of services available for deployment. Click Deploy. You can now submit queries to this service using the API node API The Sample code tab provides snippets for calling the API in various languages. As a test, you can run the following in a terminal window, substituting APINODE_SERVER by the proper hostname and APINODE_PORT by the port for your API node. You can also run the test queries previously defined in the Design node by navigating to the Run and test tab. Now these same queries are being run on the API node. In the project on the Design node, open the API designer and open the API service that you previously created. Navigate to the Model panel of the endpoint, and click Go to model page. This takes you to a list of versions of the model that have already been built. Select the logistic regression model and click Make Active to make it the active version. 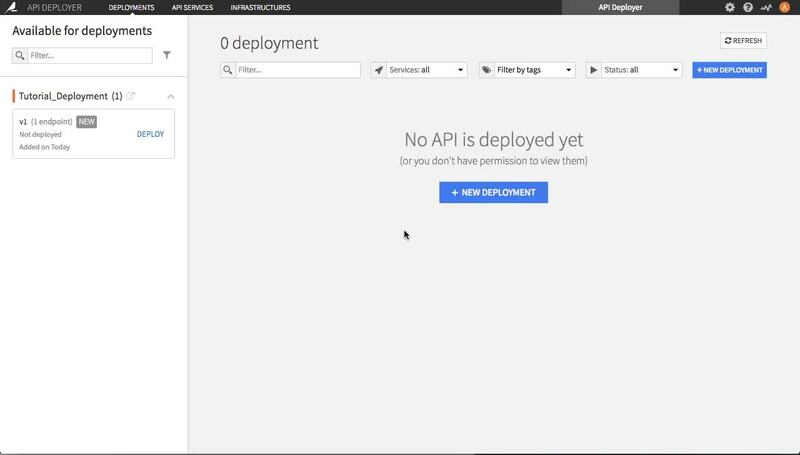 Return to the Tutorial_Deployment service and click Push to API Deployer. Let’s give the new package a more descriptive name, v2-logistic-regression. Click Deploy. In the API Deployer node, navigate to the Deployments section, where you’ll see the updated version of the service. Click Deploy. Choose to Update the service, and click OK. The service won’t be completely updated until you click Update again (in the upper right this time). Select the Light update option. Now the API node is running the latest version of the service. Congratulations! Deploying a model to production for real-time scoring and managing versions of the model is easy to do in Dataiku DSS.